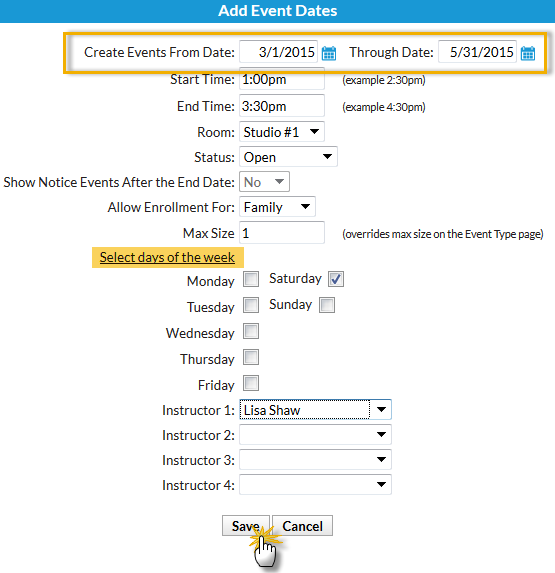 Once you have completed the first step in adding an event, adding an Event Type, you'll need to add specific dates & times when the event will occur so they can show up on your Event Calendar. 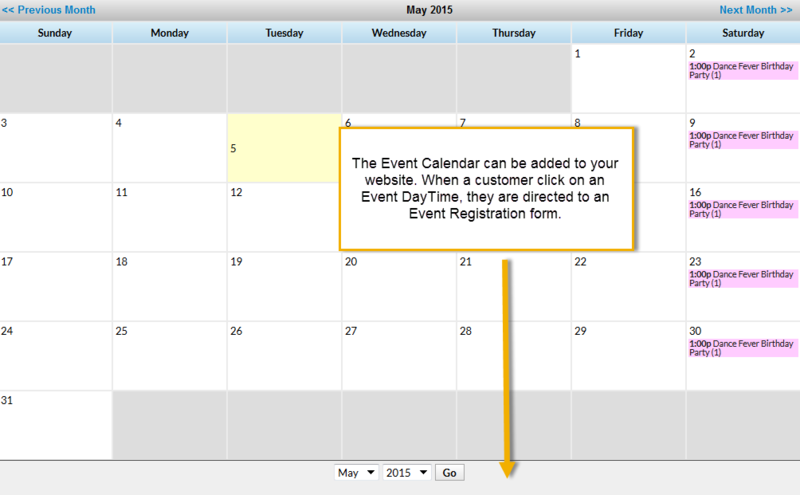 In the Event Type record, select the Add Event (Date & Time) button. In the Add Event Dates window, enter a date (or a range of dates). Add a Room if applicable. To ensure the event is displayed on your Event Calendar, set Status=Open, Notice or Unavailable (unless you have chosen to also display Booked Events). For a detailed explanation of the four options for the Status field, see our FAQ article What do the different Event Status options mean? If you set Status=Notice you can change Show Notice Events After the End Date to Yes to have the Notice remain on your Event Calendar after the date has passed. The default is No and the Notice will drop off the Event Calendar after the event date. Allow Enrollment For defaults to whatever you entered when you created the Event Type (on the Event Type Summary tab), but you can switch this selection for a specific date here if you'd like. Max Size defaults to whatever you entered when you created the Event Type (on the Event Type Summary tab), but you can change it for this event date only by changing the Max Size field. Check the correct day of the week. Add an Instructor if applicable.